Almost forgot that I saw Daybreakers the other day. Despite my bitterness over them stealing my idea (you'll pay, Hollywood. One day you'll pay) it was actually pretty good. It was refreshing to see real vampires that explode in the sun instead of sparkling, and the action was cool. It also has a surprisingly good cast (you can't go wrong with Sam Neill and Willem Dafoe). I also liked that the good vampire in the movie is called Edward. 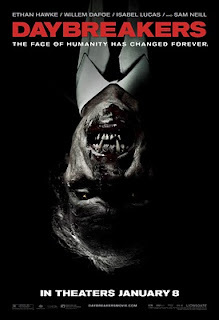 I would have liked more satire on how similar the vampire world is to our own, and the ending is way too neat, but overall it's one of the better vampire flicks of recent years. Best Movie: Up. Runners-up: District 9, Avatar, Watchmen, Inglourious Basterds (hey, alternate history counts as fantasy), Star Trek, Coraline, Where the Wild Things Are, Paranormal Activity, Drag Me to Hell.